Hi. My name is Mod Podge. What? You didn’t know that? Ok so my name is Jaderbomb but if I could create a “craft kid” I would totally name “it” Mod Podge. If you follow my blog then you should be familiar with this container of AWESOMENESS! Seriously. It’s like magic in a container. A really pretty container. 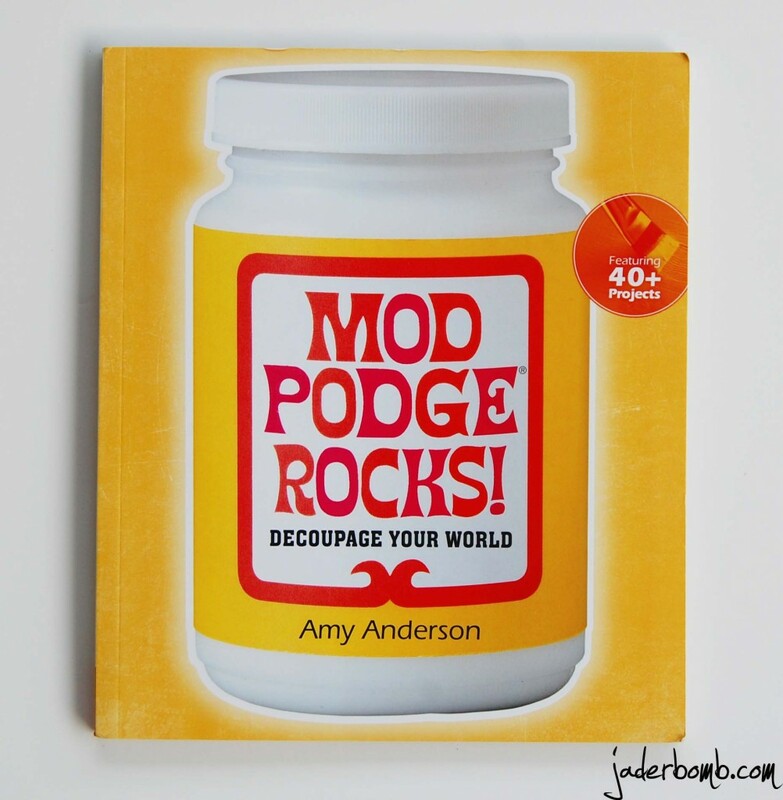 My friend Amy Anderson wrote this AMAZING book Mod Podge Rocks! Decoupage Your World. She is also the founder of the blog Mod Podge Rocks! I remember the first time I used Mod Podge. I coated my paper and freaked out because it was completely white. Being the crafter that I am I never read the instructions which simply stated it dries clear. I actually started crying because it was a craft I was working on for a couple of days and was VERY happy with the way it turned out. I thought I ruined it (no fist pump insert here). When my eyes landed on the craft I think my heart skipped a beat and instead of being happy about how the project ended my brain immediately started thinking about what it could do next with Mod Podge. This is where the addiction started. 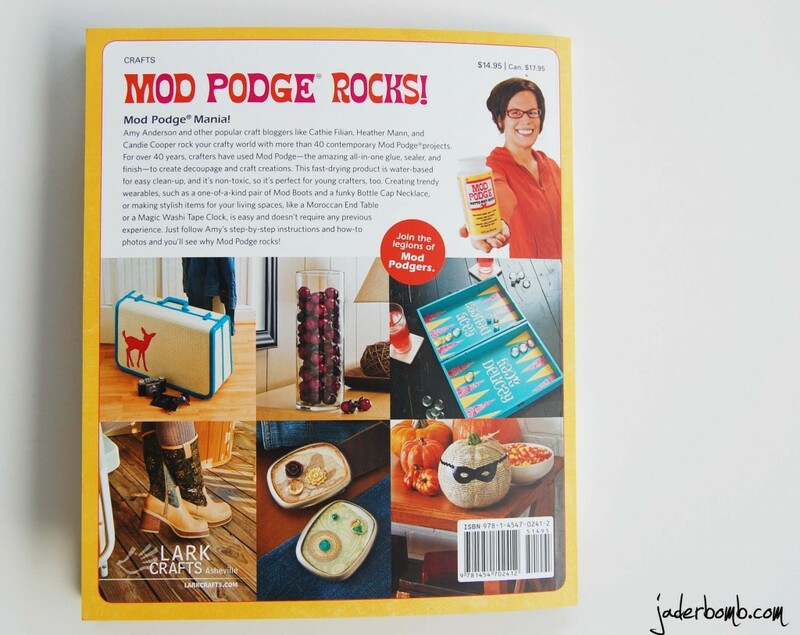 If you have never used Mod Podge or you have but are not aware of just how much you can do with it, then this book is for you. It has over 40 projects teaching you different ways you can use Mod Podge. 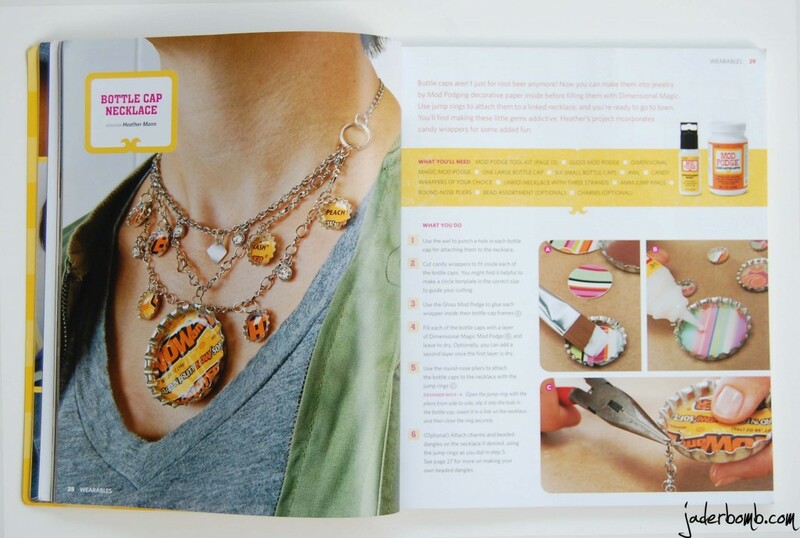 The crafts in this book are fun and creative. There are a ton of techniques and tricks in the book to make your experience using Mod Podge AMAZING! This here is my friend Amy Anderson! Isn’t she cute as a button. (hehe) I wanted to show you a sneak peak of some of the crafts in the book. These are just the ones that really got my attention so put your seatbelt’s on because we are about to Mod Podge the world! Ok. Bottom line. This is the cutest thing since sliced bread. I love working with bottle caps because you can put fun images in the center and make them very unique. I bet you would of never thought a now and later wrapper would be this cute on a person, right! Amy always proves us all wrong! I love this stool on the left. It’s a great way to dress up any room in your house! Check out the puzzle message board. Perfect for everyone! I love taking something I have and adding a special touch to it. In the beginning of the book there is a quick run down on each Mod Podge Primer. This is very helpful if you are not all that familiar with the product. Even if you are familiar it’s a great refreshment course! I promise you when you get this book your brain will be FILLED with ideas! I know what your thinking. You need this book. Maybe for yourself or you might know someone who will fall in love with it also! I think YOU need it! You can get Mod Podge Rocks! online HERE or get it at your local book store! The good news is today you can WIN it!!!!! One of my Jaderbugs will have this book in their possession very soon!!!! I will be using Rafflecopter for this giveaway. You will have a couple of ways to win this book. The REQUIRED entry is this one. Tell me why you want to win the book. Leave your answer in the comment section of this post. If you really want to get more entries you can come back every day and write a new comment or tweet about it! This giveaway is only open to US residents! This giveaway will end next Saturday which is July 14th 2012. Remember the ONLY required entry is leaving a comment, the rest are optional. But I promise if you do the rest you will have a better chance at winning! Share with your friends! We can always see who shares with social media outlets! Thanks Jaderbugs! I love this book because anyone can use this product! Amy is great! 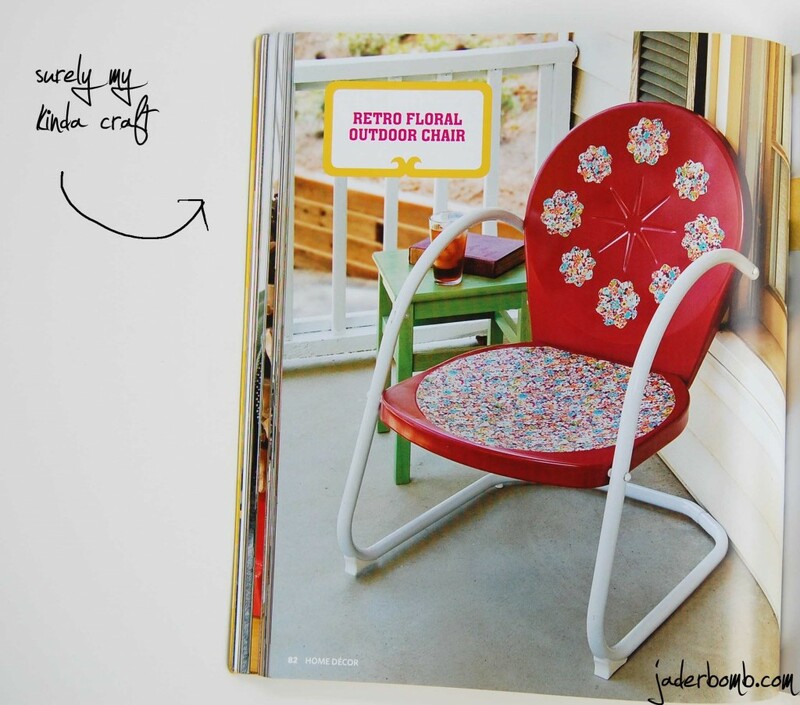 I see a few projects I’d like to try just in the pages featured here!! I would love to win this book! I admire mod-podge but have been a little hesitant about doing it myself. This book would give me the “know-how” to dive right in!!! Thanks for the opportunity! I would LOVE to win this because I could share it with SO many and inspire them to buy it and USE it. My love affair with mod podge goes WAY back and now that I teach art I could instill the love of mod podge everywhere. THANKS for your generous spirit~checking out your book is a MUST! LOVE Mod Podge! Would love to see some other creative ways to use it! I love Mod Podge! I use it all the time. As recent as yesterday, when I used it to adhere and seal photos on a stretched-canvas. I would love to win this book because I can easily flip through it for more ideas! I would like to win because I love crafting. I can’t sew, so Mod Podge is one of my favorite mediums. I’d love to get some new ideas! Mod Podge has been in my cabinet for 38 years–well, I have bought many new bottles during that time. I love the glitter one and the matte. My teenage daughter has recently discovered it, and now the tradition lives on!! I’ve never used Mod Podge and would like – no scratch that – LOVE to read this book for inspiration on something I’ve heard so much about! My retired husband and I have a couple of Modge Podge activities going on and we’re using the spray as well as the jarred. We’re making Christmas gifts now and would love more ideas! We just totally the stuff! Thank you for the opportunity to win! mod podge… oops, lol See I could learn the right name for it in the book! I am an old crafter but am new to Mod Podge. I would love some creative ideaas to do with my two girls so this book seems like just the thing. I have a train case just waiting for embellishment with Mod Podge, so I would love to see how Amy did her suitcase! Thanks for the chance to win! Modge Podge rocks! I’ve used it since My Mom taught me how now I’m teaching my “grand kids” how to use it. I love ModPodge. 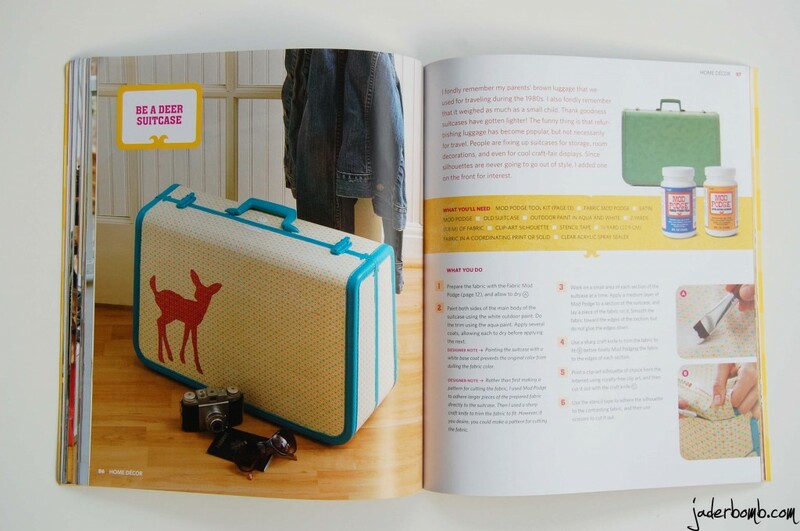 I have been using it for years…I love the new ideas in this book…..Suitcases, jewelry.. never thought of some of these great ideas!! Want to see more. Would love to try all the projects. I want this book because I love to craft. I have never tried name brand Mod Podge, only the homemade watered down glue. This would be a great chance to try the real stuff. What an inspiration! I would love to win this book! Modge Podge rocks! Because I’m an art teacher and I LOVES me some Mod Podge! I want to win because I have never tried Mod Podge. I love Mod Podge. I would decoupage everything in sight! I would love to see more inspiration. Have two reasons, first g-daughter creates lots of things and this would be great for her, and our gourds could really take on some new looks. Love to use Modge Podge. I never knew how much you can do with Modge Podge. I would love to have this book. I redid a bookcase and would love to learn more about this. I want to win the book because I know there are endless uses for Mod Podge and I am always anxious to learn more new ones. I love Mod Podge and have been using it for years. There are so many things you can do with it and I would LOVE to win this great new book. I’ve never used mod podge, but am really wanting to try it. Actually have a project right now that I’m thinking about using it on. This book would give me lots of inspiration to try it out on other projects!! Luv Mod Podge and would love some new ideas! I’m a lover of this stuff, and I want to learn more of what I can do with it! I’m sure this book would beyond inspire me to mod podge my own little world! Just last night I went to bed with a “pink” mason jar! And was my hubby impressed this morning to see a shiny RED one! I would love to win that book to keep the surprise in my marriage !!! I am so excited about this book..I have purchased my first jars of Mod Podge to use on my card making projects and other projects I can come up with…. I’d love to learn new uses Mod Podge. I have yet to experience the awesome-ness that is Mod Podge and need this book to show me how awesome the world of Mod Podge is!! I’m broke, have been looking into adhesives for my bead, wire, and jewelry work, and settled on Mod Podge. Once I started looking more closely at Mod Podge, I just wanted to play and try them all!!! This book is the perfect answer to my desire to experiment without wasting my precious Mod Podge. In other words, help me work and play in an economical fashion, please!!! 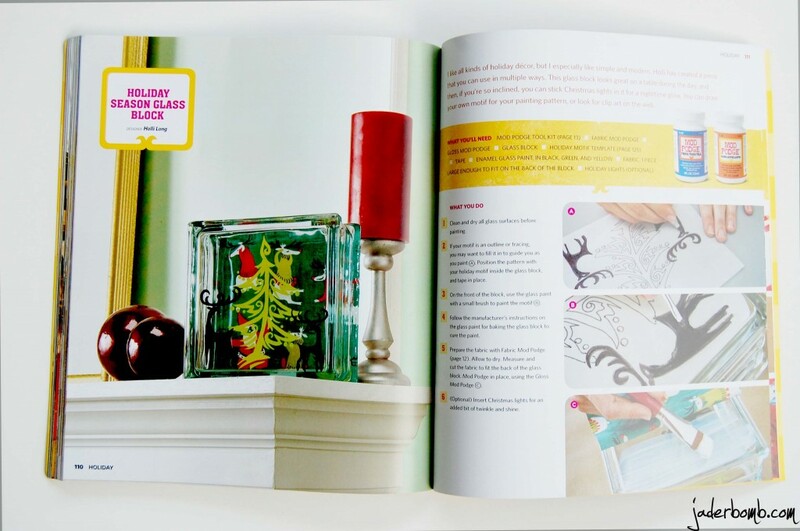 Pick me to win this book, because Mod Podge really does rock! I need this book because summer vacation is only half over and I need some new ideas to keep the kiddies engaged and creating! Thanks for the chance to win!!! I LOVE Modge Podge…..especially when glitter is involved. I’m wanting some extra inspiraton with this book! I’ve just re-discovered Mod Podge and want to get back up to speed with all the new things you can do with it, and the new formulations. I have heard sooooo many good things about this product and i would like to learn more things about it’s useage before i buy it!!!! I love ModPodge. With this book I can create lots more things for my home, my grandkids, and just for me. I’m totally hooked and would give this book the use it deserves. I use Mod Podge in many of my crafts and diy projects. I would really love to have this book for more ideas! Thanks for the chance! I’ve been coveting this book for awhile, would love to have it! Ohh…I want this book! I would love to make the stool AND the retro chair! Plus, I am a new stay-at-home mom (been a working mom for 5+ years, but I am taking the year off!) so I would love to make it a Mod Podge year!! I still think it’s so funny that all the things my dad did when I was a kid are popular again! I’v usually got a jar of Mod Podge around, and just need a good excuse to use it. Hpw about a magnetic checkers/chess set for travelling? I’m a new stay-at-home mom really digging into the arts & crafts world. However, the one thing I haven’t dabbled in (crazy as it may sound) is Mod Podge, it is next on my list & my reason for entering this give-away. 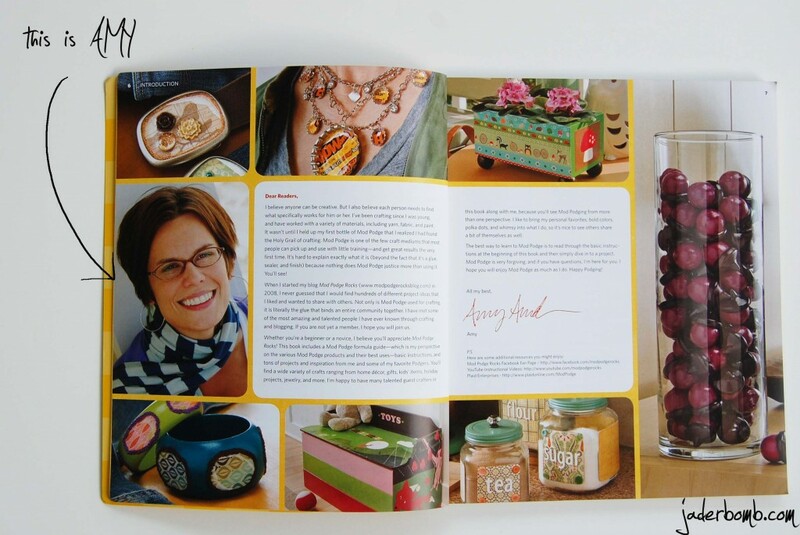 So many wonderful uses for this amazing tool Amy has in her book that I would love to get my hands on! I want to MP some furniture. I tried it on a night table and now I want to use it on everything! I want some new ideas. 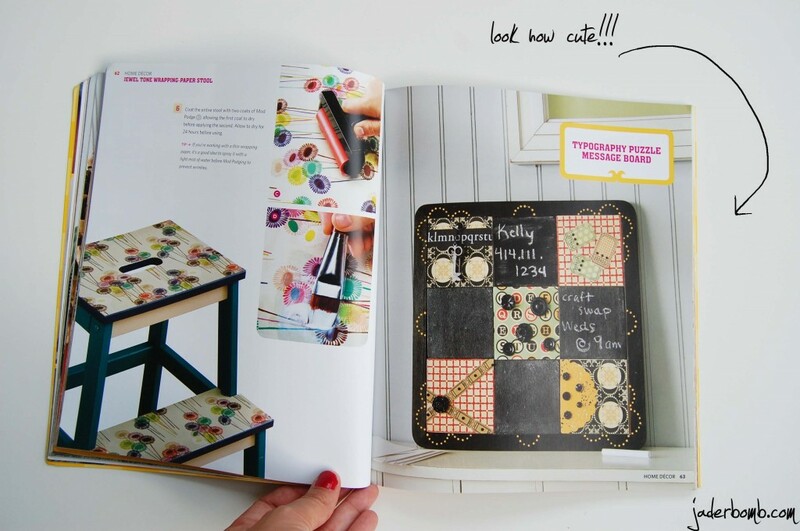 I love Mod Podge, but I feel like I’m only just discovering it – I really would like this book because I want to learn more! I would love to win this amazing book! My son loves art and decoupage and this would give us tons of craft ideas to make together! This book would be amazing to win because it’s awesome! Amy is super creative and I would love to know how to make crafts that she has come up with!! Love it! Modge Podge DOES rock! I would love to win to find out more fun ways to use it. Thanks! I have a confession…I’ve never ever used Mod Podge…so I would LOVE to win so I can finally try all of the really cool things you all do with it!!! 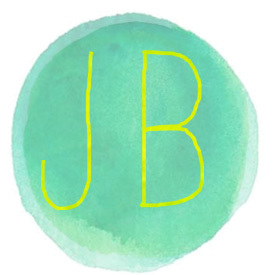 Jaderbomb – i love all your crafty ideas. I want to try some MP like you. I love Mod Podge, but need some more ideas on how to use it! I totally want this book because I love to use Mod Podge and I’m too lazy to come up with my own crafts (Hey,I like to take naps). I’ve never tried the glitter Mod Podge and I’m ready to sparkle up my crafts (Blingity Bling). I’m actually interested in learning new technique’s in applying this awesomeness to my crafts.